The Outlaws lost 53-42 to Seaside, the No. 2 seed, in the first round of the 4A state playoffs on Saturday, March 2. Sisters played tough defense in the first quarter, but on offense missed several good looks at the basket and had some costly turnovers. At the close of the period the Outlaws trailed 10-7. Jack Berg picked up two fouls in the first quarter and a quick third in the second and had to sit out the remainder of the first half. The Outlaws worked hard to stay with the Gulls and at the half were down by just five, 23-18. In the second half, the Outlaws went down by eight and from there struggled to get back in the game. The Gulls slowly extended their lead and beat the Outlaws by 11. Sisters had 13 turnovers, most of which were due to forced passes and over dribbling in the half court. The numerous turnovers were costly against the quick-pressure Seaside team. Brad Eagan, Ryan Waddell, and Zach Anderson all took turns bringing the ball up the court against the Gull's full-court man-to-man press, and Coach Rand Runco told The Nugget he felt they all did a great job. The Gulls beat the Outlaws on the glass, and scored over 10 of their points on the offensive boards. Runco noted that the Gulls were a bit stronger, and their quickness and aggressiveness took its toll. 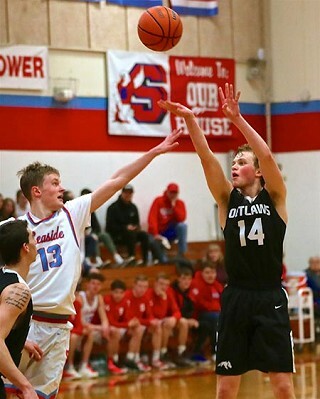 Noah Richards led the Outlaws squad with 13 points. Ryan Waddell scored nine points and Zach Anderson and Jack Berg each scored eight points. "We are really proud of the boys," said Runco. "They played hard the entire game and never let it get away, but kept battling back. It was a really tough loss and disappointing. Our goal was to go further, but we played well against a really good team. The game really could have gone either way." "This is a great group of seniors and they will be missed," added Runco. "They are not only great basketball players, but are quality young men that represented the Outlaws well."